On Wednesday April 11, Barry Fortner, SVP & President Specialty Physician Services joined Dr. Harsha Vyas, M.D. Hematologist/Oncologist at Cancer Center of Middle Georgia on Capitol Hill to brief Members of Congress on the U.S. Department of Veterans Affairs’ (VA) recent audit to claw back reimbursement for oncology services provided to Veterans going back several years. 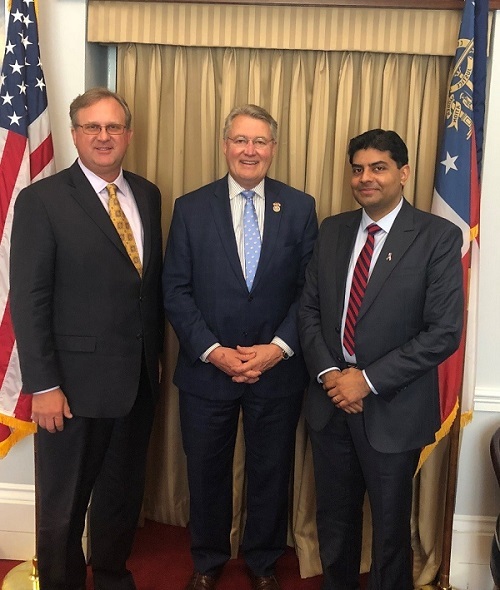 Breaking away from the annual COA and LPP National meetings to advocate on this critical issue, Barry and Dr. Vyas met with Congressman Rick Allen (R-GA), Dr. Vyas’ hometown Congressman, as well as staff from the offices of Senate Veterans Affairs Committee Chairman Johnny Isakson (R-GA), House Veterans Affairs Committee Chairman Phil Roe (R-TN), and House Veterans Affairs Committee Members Gus Bilirakis (R-FL), Julia Brownley (D-CA), and Brad Wenstrup (R-OH). Barry and Dr. Vyas provided much-needed context on the issue: many community oncologists, especially in non-metro areas, have been providing care to our Veterans for many years because oftentimes the closest VA facility is far away and VA hospital wait times are excessive. In most cases, these oncologists provided care without an agreement, contract, registration or negotiated rates as an out-of-network private physician practice. The local VA pre-authorized Veterans to seek care, providing practices assurance that services were approved. Now the VA has hired a third-party contractor to recoup what they deem to be overpayment on claims dating as far back as 2011. This has led to a sudden disruption for Veterans’ access to cancer care. Members of Congress committed to contacting VA immediately and AmerisourceBergen will continue to push for a quick resolution to this issue. 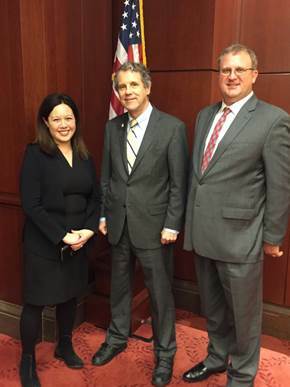 On March 16th, Barry Fortner, SVP & President Specialty Physician Services and Lisa Harrison, VP Practice Business Solutions joined Dr. Gary Kay with Northwest Hematology & Oncology on Capitol Hill to brief bipartisan members of Congress on two major issues affecting community oncology, DIR fees and Medicare Part B Reimbursement. The group met with House Ways and Means Health Subcommittee Chairman Peter Roskam’ s (R-IL) staff, Dr. Kay’s hometown Congressional Representative, as well as staff from the offices of Reps. Buddy Carter (R-GA) and Billy Long (R-MO), as well as Senators Mark Warner (D-VA) and Chuck Grassley (R-IA). Barry, Lisa, and Dr. Kay stressed the harmful effects retroactive DIR fees and the flawed Part B prompt pay discount reimbursement error continue to have on high quality, cost-effective, community-based practices. During the visit, Dr. Kay extended an invitation for Chairman Roskam to visit Northwest Hematology & Oncology to meet Dr. Kay’s dedicated coworkers and staff making a huge difference in patients’ lives every day. AmerisourceBergen continues to push for practical solutions so community-based practices can focus on treating patients and not have to worry about devastating DIR fees and flawed Part B reimbursement formulas. When oncology practices speak as one, policy can change. The Medicare Part B prescription drug model is a prime example. The experiment was intended to limit spending on cancer treatments administered in outpatient settings, including chemotherapy and biologics. In May 2017, the Community Oncology Association (COA) submitted a formal letter requesting cancellation of the program, citing its negative impacts on patients—specifically, the elderly—and community providers. By November, the experiment was abandoned. This type of concentrated effort will help enact meaningful change that allows physicians to continue providing the highest-quality care. Many resources can guide oncologists who want to educate themselves on the issues shaping the future of their care. The advocacy program Community Counts2 provides information on regulatory issues affecting community oncologists. Professional societies such as COA, the American Society of Clinical Oncology, and the Association of Community Cancer Centers are also fantastic hubs for information. In addition to keeping abreast of regulatory changes, physicians must learn how to operate more transparently. For example, electronic practice management and clinical systems can streamline business. Electronic practice management systems automate the billing, claim processing, revenue management, and reporting functions that would ordinarily be performed manually by staff. The time saved can be used to focus more on patient care. However, to best implement these tools, providers need to apply pressure to vendors and regulators who control data sharing so that interoperability and standardization evolve to fit the needs of community practices. As this happens, these tools will help improve conformance with treatment guidelines and policies on payment. Also, by having data at hand, practices can clearly see where payment gaps exist and work to close them. The technological resources available now are breathtaking. Clinical decision-making, cost-management, and revenue-management tools are critical resources for evaluating a practice’s overall health. Resources such as Innovation Cancer3 connect practices to critical technology that can review and monitor inventory, payer contracts, and treatment regimens, providing a critical level of support to practices. In this new era of value-based care, community oncologists should champion for models of value and cost-effectiveness that help them become more efficient and viable. These healthcare professionals are uniquely positioned to be leaders in valuebased care, as their deep ties to the communities they serve allow for more streamlined management of care. Initiatives like the Oncology Care Model (OCM) use financial incentives to promote high-quality, coordinated care. The Center for Medicare & Medicaid Innovation is creating additional pilots that would save money for Medicare and Medicaid, and there is opportunity for community oncologists to opt in early. By participating in the OCM and other value-based care models, community oncologists can address patient needs and be paid appropriately for the care they provide. While questions around Medicare Part B cuts and the tax bill’s impact may make the forecast for community oncologists seem bleak, opportunities do exist. Community oncology continues to be a positive driver in the evolution of new payment models and programs. This year, we expect to see the results from the OCM program and find out whether it becomes more widely adopted. With new and innovative treatments in the pipeline, community oncologists will play a significant role in how these therapies will reach patients. By continuing to advocate for themselves and become more efficient, transparent, and accountable, community oncology practices can continue to stand as vital resources for high-quality, lower-cost care in their communities. Join the Community Care Access Coalition (CCAC) for a “Day of Action” on Monday, December 11th to rally support for S. 1304 and H.R. 1920, bipartisan legislation to protect access to community-based care and stabilize Medicare Part B reimbursement by excluding so-called “prompt pay” discounts as part of the formula used to calculate Medicare payments to physicians. CCAC encourages members to post content to social media and other platforms throughout the day advocating for this needed prompt-pay fix. CCAC will also be Tweeting throughout the day from their newly-launched Twitter handle: @CCACadvocacy. CCAC has provided a toolkit full of suggested Tweets and Facebook posts, shareable graphics and a letter template that your organization can plug into Capwiz, Popvox or similar platforms to activate your grassroots members with a consistent message. Download the day of action toolkit HERE. 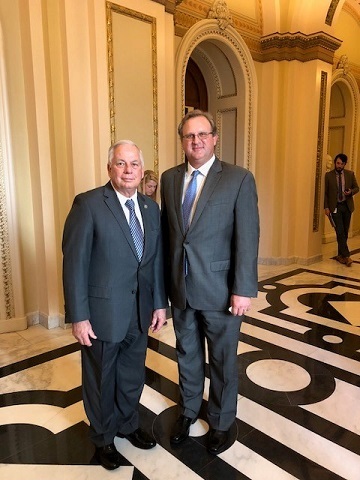 On November 3, Barry Fortner, PhD, President, Specialty Physician Services and Brad Tallamy, Director of Government Affairs at AmerisourceBergen urged Congressional leaders to pass H.R. 1920, cosponsored by Reps. Fred Upton (R-MI), Gene Green (D-TX), John Shimkus (R-IL), Diana DeGette (D-CO), Pat Tiberi (R-OH), Peter King (R-TX), Ron Kind (D-WI), Pete Sessions (R-TX), Buddy Carter (R-GA), and Pat Meehan (R-PA) which excludes distributor prompt pay discounts from Medicare Part B Reimbursement. This long-sought exclusion would correct an error that reduces reimbursement for Part B providers, hitting community-based practices particularity hard – AmerisourceBergen alone has lost nearly 1200 physician practice customers since 2005. Barry and Brad met with Energy and Commerce Health Subcommittee Chairman Michael Burgess (R-TX), Energy and Commerce Health Subcommittee Ranking Member Gene Green (D-TX), Rep. Terri Sewell (D-AL), as well as staff from the offices of Reps. Pete Olson (R-TX), Kenny Marchant (R-TX), Sam Johnson (R-TX), and Bill Flores (R-TX) to communicate this message and urge members to include H.R. 1920 in must-pass Medicare legislation expected later this year. Barry walked through data highlighting that community-based practices continue to provide cost-effective, high quality patient care, and explained that correcting the prompt pay error will help preserve patient access to this site of care going forward. Following the meetings, Reps. Sewell and Marchant indicated that they would cosponsor the legislation. ABC has supported legislation correcting the prompt pay error for many years and we will continue to push to ensure patient access to community-based care is preserved. U.S. Congressman Gene Green was appointed to the House Energy and Commerce committee in 1996 and continues to serve today as the Ranking Member for the Subcommittee on Health for the 115th Congress. Rep. Green is the lead Energy and Commerce Democrat on Prompt Pay. U.S. 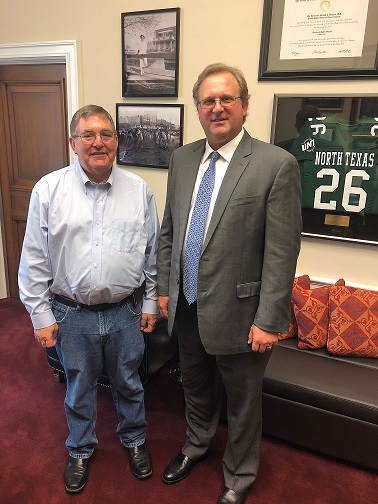 Congressman Michael Burgess serves on the prestigious House Energy and Commerce Committee as the Chairman of the House Energy and Commerce Subcommittee on Health and is the most senior medical doctor serving in the House of Representatives. 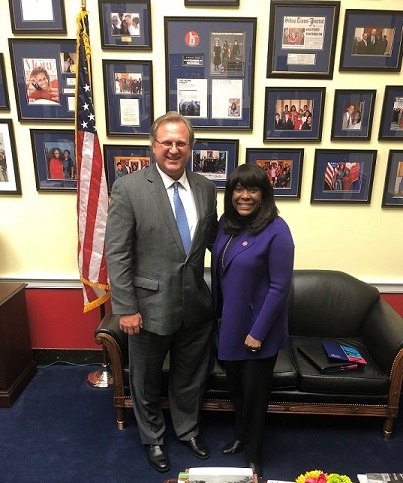 U.S. Congresswoman Terri Sewell has a strong history of commitment to healthcare, serving as the lead Democrat on oncology medical home legislation. Rep. Sewell led efforts to repeal the Part B Demo last year, and has agreed to cosponsor the Prompt Pay Bill. The Part B Demo was the Obama Administration’s final effort to address drug pricing. In an attempt to force physicians to prescribe cheaper medications, the Demo would have cut reimbursement for Part B drugs whose ASP exceeded $480. Since its proposal in 2016, ABC took a leadership role in opposing the Demo by building collaborative stakeholder and grassroots support, developing bipartisan Congressional opposition letters, and advancing data-driven arguments to illustrate the Demo’s impact on community-based practices and patients. Our efforts effectively disproved the flawed premise that physician prescribing behavior is driven by Medicare reimbursement rather than patients’ best interest. Under the Trump administration, CMS has signaled it will evaluate new payment models that improve quality, accessibility, and affordability. ABC will continue to lend our expertise and data-driven insights to the Agency’s efforts while also ensuring patient access to innovative medications as value-based payment models evolve. 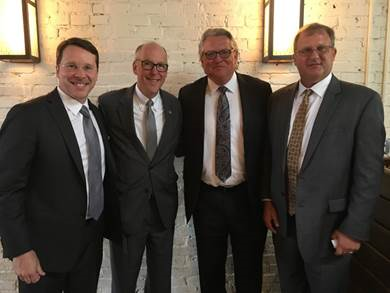 On September 23, U.S. Rep. Doug Collins (R-GA) joined Stacie Heller, VP of Policy, Brad Tallamy, Director of Government Affairs and Dr. David Eagle, past president of the Community Oncology Alliance (COA) in a policy-focused panel discussion at an ION Solutions meeting in Atlanta, Georgia. After Stacie Heller kicked off the session highlighting major policy victories over the past 12 months, including the Part B Demo withdrawal and CVS Caremark’s in-office dispensing exclusion reversal, Rep. Collins delivered an impassioned address about the harmful effects of DIR fees and other PBM practices on community providers’ ability to deliver high-quality, patient-centric care. The panel delved into other issues affecting community-based care, including sequestration, the distributor prompt pay discount inclusion in Part B reimbursement, Medicare Access and CHIP Reauthorization Act (MACRA) implementation, and the 340B Drug Pricing Program. 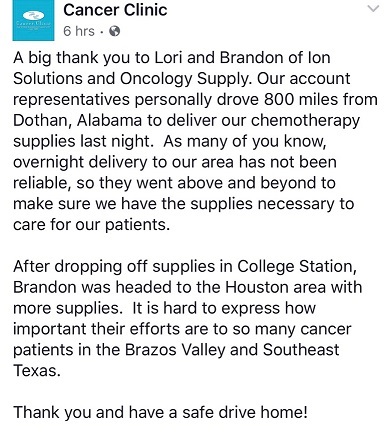 ION Solutions’ Lori Pace and Oncology Supply’s Brandon Osborn exhibited resilience in the aftermath of Hurricane Harvey, determined to deliver cancer drugs to practices affected by the storm. The two split up the drug inventory and navigated water-filled Houston streets in the hopes of making successful deliveries. In the end, Lori and Brandon drove hundreds of miles and went above and beyond to serve oncology patients. 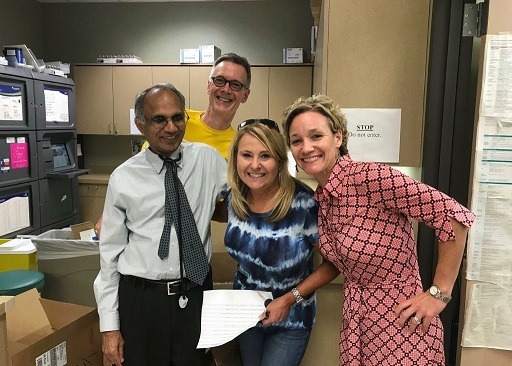 As soon as predictions of an epic storm for the Texas coast hit the airwaves, the Oncology Supply team members in Dothan, AL quietly morphed into survival mode. Fitting for a group who's navigated Hurricane Katrina, 9/11 and numerous other natural disasters, the OS team was calculating the path of least resistance into the eye of the storm, all while government officials were announcing evacuation routes away from what would soon be known as Hurricane Harvey. Shown above is ION's Lori Pace (in tie-dye) making a drug delivery after Hurricane Harvey. Meanwhile, in Madison, MS, Brandon Osborn, Senior Account Manager for Texas, Louisiana and Arkansas and the OS sales rep who has assisted hundreds of customers along the Gulf Coast for 15-plus years, began orchestrating a plan with his ION counterpart in Texas, Lori Pace, and the OS customer service team back in Dothan. After repeated conversations with both Fed Ex and desperate customers who were being impacted by Harvey, all it took was approval and encouragement to get this show on the road. Before leaving Mississippi, Brandon rented a new Chevy Tahoe with two miles on the odometer and ample space to store his valuable cargo. Arriving at the OS distribution center at 11:30 on the night of Wednesday, Aug. 30, Brandon met Tim Koogler, Director of the Oncology Supply distribution center. 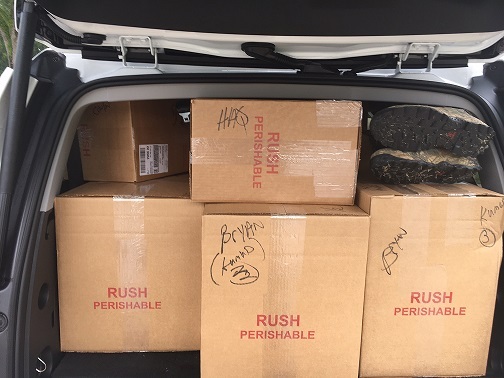 Together, they packed the SUV with the life-saving drugs for cancer patients who were stranded in the wake of what would be the one of the worst storms in Texas history. Tim, another OS veteran, squeezed the last box into the remaining free space of the Tahoe and slammed the door before anything could fall out. "We felt as if we had just played a long game of car Jenga," said Brandon. The two men hugged and shook hands, and Brandon left Dothan around 12:45 am. He headed west just as remnants of Harvey headed east. He didn't know exactly how he'd get there, but he did know that he had only 48 hours to drive 900 miles into a Category 4 storm to deliver life-saving refrigerated drugs. With I-10 being completely shut down at the Texas border, Brandon had to plot a course through some back roads that eventually allowed him to cross into Texas over an old bridge inches above rising waters close to the town of Jasper. By this time, traffic had begun to increase. Numerous utility trucks and FEMA rescue services were also trying to make their way into Texas. Watching the sun rise in his rearview mirror, he knew this would be the most challenging Thursday of sales calls he'd ever make. However, the calls of support from his "work brothers and sisters" kept Brandon motivated. Back in Dothan, the OS team was in the office early that Thursday morning helping coordinate deliveries with Brandon, Lori and the affected customers. As the storm stalled over Houston, causing epic flooding to the entire city and surrounding communities, plans changed every time a road closure was announced — which was every few minutes — complicating the most elementary components of the process: GPS. Despite numerous road closures and unpredictable cell service, Lori met up with Brandon in Huntsville, Texas. They split some of the inventory to try and overcome the distance between the clinics in the time they had left to make their deliveries. They wished each other good luck and quickly headed their separate ways. Patience and cell service became critical to making any successful drops at clinics in and around the flooded metropolis of Houston. Finding an open road in a water-filled, deserted city street became the greatest obstacle for Brandon and Lori. Epic flooding had caused both sides of Houston's I-10 interstates to be shut down. "This became a real challenge, considering detours had limited entry available only from the north, which meant significantly more drive time to the area," said Brandon. The result was that Thursday's deliveries would have to be made after 5:00 pm. Hours later, Brandon was able to make his first successful delivery to an office full of stranded but extremely grateful employees and patients. Witnessing their gratitude, Brandon was even more determined to leave Texas with an empty truck. Along with vital assistance from the team back in Dothan, Brandon made deliveries to most of the affected clinics throughout the day on Thursday. His last stop for the day, at 11:30 that night, was an emotional one. Overwhelmed from both exhaustion and exhilaration, they all hugged and cried, realizing that this was no ordinary work day. Early the next morning, while charting out his map for the day, Brandon received a call from Edward, the pharmacist at one of his Houston clinics that was on his delivery list for the day, asking Brandon to come to the office right then. Brandon was escorted to the conference room, where he was met by the board members of the practice. With tears in his eyes, the COO, on behalf of the board and staff, thanked Brandon for his commitment to him and his practice, but mostly to their patients. The administrator talked of how patients from a nearby large regional hospital, who were turned away, had been sent to their practice for 2nd and 3rd line treatments and were now able to be treated simply because of the efforts made on their behalf by Brandon, Lori and the OS team. 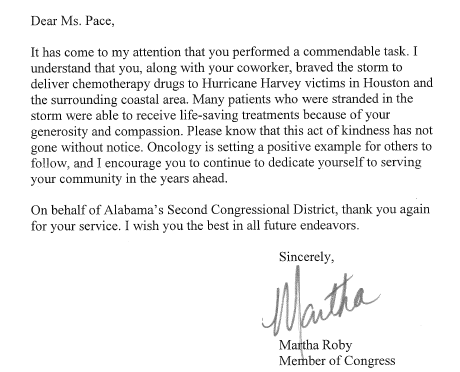 On Monday, September 25, Lori received a commendation from United States Representative Martha Roby for her generosity and compassion to Hurricane Harvey victims. By the time Brandon returned his gently used Chevy Tahoe at the Dallas airport, the odometer read 1,544 miles. On July 11th, U.S. Representative Martha Roby (R-AL) made her second trip to Oncology Supply’s (OS) Dothan Headquarters. Rep. Roby first met with OS’ senior leadership team, including Dave Leverette, President Provider Solutions, Barry Fortner, President Oncology Supply, Peter Covert, VP Operations, Branham Hanchey, Director Customer Service, Brad Tallamy, Director Government Affairs AmerisourceBergen, Angela Lewis, HR Manager, Shirley Sapp, VP Procurement, Jennifer Leverette, VP Customer Relations, Tim Koogler, Director Operations, Dirk Shimabukuro, VP Information Technology, Daphne Faulk, VP Finance, Jeff Hale, Director Automation, Donna Westmoreland, Director of Contracts & Chargebacks, Melinda McClendon, Director of Marketing, Sophia Jones, Director of Sales Operations, Bryan Darrow, Director of Procurement, Charles Gallion, Warehouse Manager, Kelly Hart, Director Credit & Collections, and Brannon Lucas, Director of Financial Planning and Analysis. Following this meeting, Rep. Roby participated in a Town Hall attended by nearly 100 OS associates where she provided an update on health care reform and her efforts to promote growth and support veterans in the District and across the country. 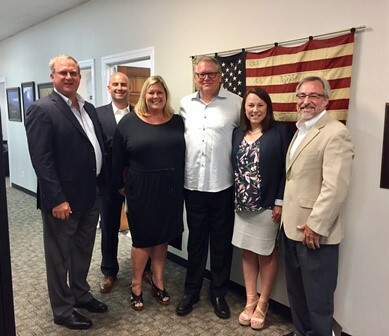 Barry Fortner thanked Rep. Roby for her opposition to last year’s Part B Demo and efforts to eliminate the Medicare sequester which continues to threaten patient access to community-based care. Barry also updated Rep. Roby on ABC’s multiple meetings with the Trump Administration. Rep. Roby appreciated our efforts and committed to continue championing this critical issue. 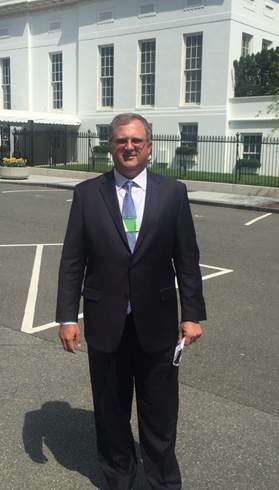 On April 13th Barry Fortner, President of Oncology Supply and Brad Tallamy, Director of Government Affairs, ABC met with President Trump’s top health advisors on the Domestic Policy Council (DPC) and the Office of Management and Budget (OMB). Barry urged White House staff not to implement harmful policies, such as Part B payment cuts or reinstatement of the failed Competitive Acquisition Program (CAP) which would disproportionately harm community-based care and increase costs for patients and Medicare. In response to the Administration’s request for ideas to lower drug prices, Barry encouraged staff to consider policies aimed at increasing competition in the marketplace by incentivizing robust generic and biosimilar markets, promoting increased provider competition by removing Part B sequester cuts and correcting the prompt pay reimbursement error. Barry also stressed the importance of better infrastructure and more streamlined processes to bring value-based arrangements and higher value treatments to market quicker. White House staff appreciated our insights and requested an ongoing dialog as they consider myriad options to lower drug prices, one of President Trump’s enduring commitments. ABC committed to partnering in this effort given our broad insights across the supply chain and leadership in developing innovative, patient-centric solutions. Following the White House visit, on April 27th James Frary, EVP and President ABSG, Dave Leverette, President Provider Solutions, Barry Fortner, Mark Santos, President ION GPO, Vicki Albrecht, EVP and GM ION Solutions, Bob Dowling, VP Medical Affairs and Policy ION Solutions, Shannon Coven, VP ION GPO, Brian Ansay, VP ION, Lisa Harrison, Sr. Director Pharmacy and Clinical Services ION Solutions, Peter Covert, VP Operations Oncology Supply, Branham Hanchey, Director Customer Service Oncology Supply, and Gary Shaban, Sr. VP of Sales for Oncology Supply hit Capitol Hill to reinforce this message and thank Members for supporting community-based care. 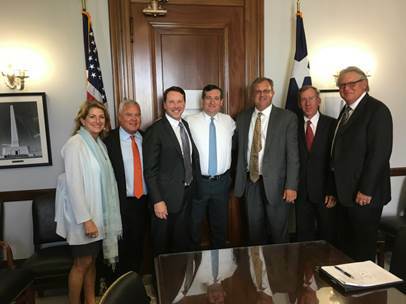 The team met with Senator Ted Cruz (R-TX), Reps. Ron Kind (D-WI), Ways and Means Committee Chairman Kevin Brady (R-TX), Doris Matsui (D-CA), Energy and Commerce Committee Health Subcommittee Chairman Michael Burgess (R-TX), Ways and Means Health Subcommittee Chairman Pat Tiberi (R-OH), Energy and Commerce Committee Chairman Greg Walden (R-OH), Energy and Commerce Committee Ranking Member Gene Green (D-TX), and Ways and Means Committee Ranking Member Richard Neal (D-MA). Our leaders reminded Members that community-based specialists are well-equipped to continue providing high quality, cost-effective patient care, but encouraged them to support legislative and regulatory efforts to remove sequestration, correct prompt pay, address DIR fees, and support innovative alternative payment models in order to preserve this site of care. 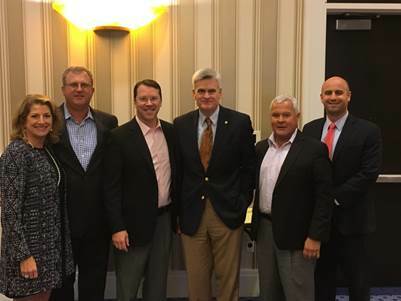 After joining colleagues from ASCO, ACCC, Cardinal Health, and McKesson on panels at the Annual COA Conference, on April 29th ABSG and ABC Government Affairs leaders joined Senator Bill Cassidy (R-LA) at ION’s Large Practice Program Advisory Panel (LPP) prior to the National Meeting in Washington, D.C. Senator Cassidy outlined his proposal to repeal and replace the Affordable Care Act (ACA), The Patient Freedom Act of 2017 , which would grant states power to “increase access to health insurance and improve patient choice, while preserving important consumer protections” from the ACA. Senator Cassidy touted his legislation as a solution that meets the needs of ACA supporters as well as those who desire a more market-based approach. Senator Cassidy also touched on issues of concern to community oncologists, such as 340B, sequestration, prompt pay, OCM’s 2-sided risk program, and drug pricing generally. 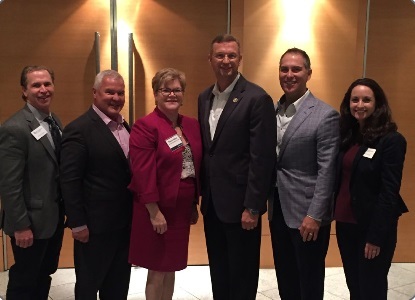 On May 1st, Barry Fortner, Rita Norton, SVP of Government and Public Policy, and Brad Tallamy brought our message to recently confirmed Centers for Medicare and Medicaid Services (CMS) Administrator Seema Verma. Ms. Verma acknowledged the value of community-based care and confirmed that the Agency is looking wholeheartedly at drug pricing and is currently assessing many separate proposals, including value-based pricing. Barry, Rita, and Brad offered to be a resource to these discussions and encouraged Ms. Verma to support efforts to remove sequestration, correct prompt pay, and address concerns regarding CMS’ Oncology Care Model’s 2-sided risk program in order to provide immediate relief for our ION customers. 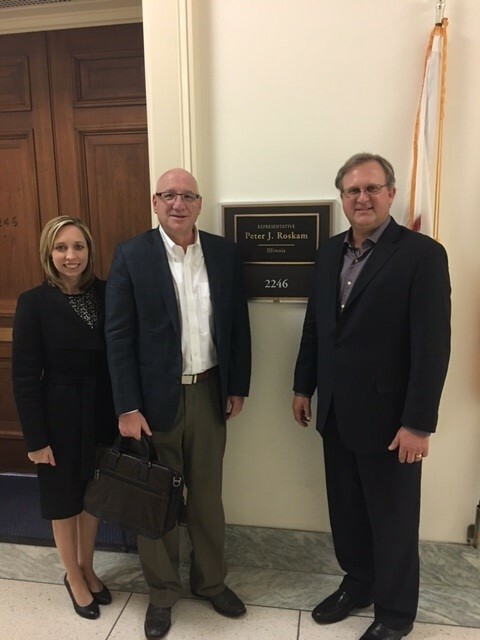 On February 8th, 2017, Vicki Albrecht, Senior Vice President & General Manager of ION Solutions and Barry Fortner, PhD, President of Oncology Supply visited Capitol Hill to brief Trump Administration staff and bipartisan members of Congress on ABSG’s 2017 policy priorities. In a conversation with senior White House Domestic Policy staff, Vicki and Barry reinforced ABSG’s commitment to the continued development of innovative, patient-centric value-based payment models; staff advised that indeed, these models are the future of care delivery and a priority for the Trump Administration. Vicki and Barry agreed, and reminded staff that community-based specialists are well-equipped to continue providing high quality, cost-effective patient care, but stressed devastating reimbursement cuts like sequestration, ASP prompt pay discount inclusion, and retroactive DIR fees, continue to exacerbate the closure and consolidation of community-based sites of care. 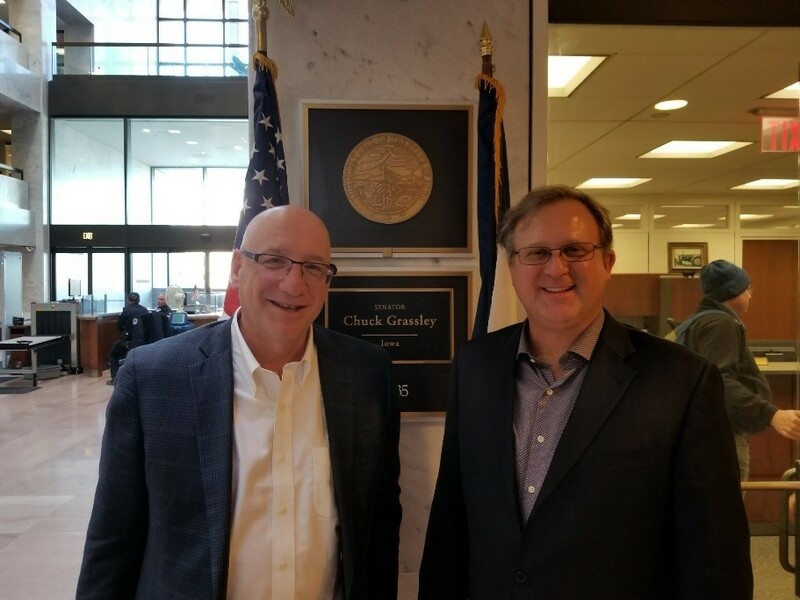 Vicki and Barry also met with Senators Sherrod Brown (D-OH), Chuck Grassley (R-IA), and John Cornyn (R-TX), as well as Reps. Pat Meehan (R-PA) and Vern Buchanan (R-FL) to discuss preserving CMMI, which can serve as a critical mechanism to develop and test new patient-centric, value-based payment models, as long as models are developed appropriately with input from both stakeholders and Congress—a stark contrast to last year’s misguided Part B Demo, which ABSG helped kill. Vicki and Barry also shared key practice experiences affecting MACRA implementation, OCM, and any new APM models currently being developed in Congress, in addition to the importance of developing a robust biosimilar market. The members urged ABSG to keep them apprised of our perspectives on these issues and to continue to advance data-driven, analytical expertise going forward. On June 15, the American Medical Association (AMA) passed a resolution in opposition to CMS' Part B Drug Payment demonstration. The resolution requests CMS to withdraw the demo. If that request is not met, the resolution states that AMA will work with lawmakers to block the experiment's implementation. “Whereas, The proposed Part B Drug Payment Model narrowly focuses on one aspect of Medicare reimbursement while ignoring overarching problems with Medicare’s current reimbursement paradigm, including the fact that Medicare does not reimburse or under reimburses for many of the health care services that patients need and physicians provide...RESOLVED, That our American Medical Association request that the Centers for Medicare & Medicaid Services (CMS) withdraw the proposed Part B Drug Payment Model... and be it further RESOLVED, That our AMA support and actively work to advance Congressional action to block the proposed Part B Drug Payment Model if CMS proceeds with the proposal,” says the resolution passed at the AMA's annual meeting. The resolution also advocates against policies that could undermine access to the best course of treatment for patients and makes a recommendation to CMS to collect and consider feedback from patients and physicians when looking to alter reimbursement. Previously, AMA wrote to CMS that, while it “strongly supports efforts to investigate and control the escalating cost of prescription drugs and biologicals,” the agency should withdraw the first phase of the demonstration because the cuts could undermine beneficiaries' access to care and move treatment to a higher-cost delivery site. ION Solutions and IPN recently submitted comments regarding the Part B Drug Payment Model to CMS via a letter from Mark Santos, RPh, President, ION GPO and Vicki Albrecht, PhD, Senior Vice President and General Manager, ION Solutions. ION and IPN will continue to fight alongside you against the potentially harmful experiment. Access the letter HERE. Charles Grassley, the United States Senator for Iowa, recently issued a letter to The Department of Health and Human Services in which he expresses concern about CMS’ Part B Drug Payment Model and the effect it may have on patients. Senator Grassley raised many important questions that need to be answered about the CMS experiment. Read Senator Grassley’s LETTER. Last summer the nation was shocked when former President Jimmy Carter announced he had been diagnosed with cancer that had spread to his brain. Then, just over four months later came another shock when he announced that a groundbreaking immunotherapy regimen that had, miraculously, put his cancer into remission. There are stories like President Carter's across our state and nation of thousands of desperately ill patients facing cancer who turn to cutting-edge alternatives and have their lives saved. Access to such cutting-edge treatments is now in jeopardy. Federal officials recently announced a mandatory Medicare "experiment" that will make it much harder for North Carolina's most vulnerable patients to receive life-saving medications. Government bureaucrats at the Centers for Medicare & Medicaid Services (CMS) are targeting Medicare Part B, which covers drugs that have to be administered under a doctor's supervision, such as those for cancer, cerebral palsy, and immune deficiency disorders. Doctors who treat Part B patients pay for these services directly and then bill Medicare for reimbursement. Part B plays a crucial role in the lives of the 1.7million North Carolina's currently enrolled in Medicare. For many, it's the only way they can afford the drugs that keep them from dying - and the recently announced CMS experiment will jeopardize their care by making it much harder for physicians to provide treatment. First, officials are ratcheting back physician reimbursements in the experiment, cutting the way they pay doctors in Medicare by about two thirds. Many doctors have already opted out of Part B because it pays so little. The existing way it is paid for by the government is simply financial untenable: many doctors lose money on every enrollee they treat. In fact, some community oncologists already send their Part B cancer patients to hospitals to receive chemotherapy because they can't afford to administer it in-house. Further reimbursement cuts will prompt even more doctors to abandon the program, and Part B patients will have an even harder time finding someone to treat them. Next, the experiment will install what it calls a "value-based care" model that pushes physicians to prescribe cheaper treatments. This will discourage them from using the newer, more advanced drugs such as those that helped President Carter. Whose "value" the government will be used to determine if or if not patients can receive drugs is still not clear, but we are being asked to trust the bureaucrats that they know and will get things right. What is most insulting is that this experiment represents a profound intrusion of the government into the doctor-patient relationship. Medicare officials are saying doctors don't know what is best for their patients. And if this experiment becomes reality, the government could effectively dictate what treatments we choose based on cost, not what's best for our patients. If CMS gets its way with this experiment, there is a very real possibility that desperately ill North Carolina patients who aren't lucky enough to be a former President of the United States could be denied the moonshot treatments that save lives. This experiment is the absolutely worst thing we could do to our nation's fight against cancer. David Eagle is a practicing medical oncologist with Lake Norman Oncology in Mooresville. If you have cancer, chances are your outpatient chemotherapy treatment costs are higher if your oncologist works for a health care system than if she has her own practice, a recent study found. The study by researchers at the University of Chicago analyzed private health insurance claims data from the Health Care Cost Institute, a nonprofit research organization, and national data about consolidation among doctors and hospitals between 2008 and 2013. It found significant consolidation between outpatient oncology practices and health care systems in the decade leading up to 2013. The researchers linked that to a rise in spending on drug-based cancer care. Each 1-percentage-point increase in the proportion of medical providers who were affiliated with a hospital or health system was associated with a 34 percent increase in annual average spending per person on outpatient cancer drug treatment, they reported. Part of the rise was fueled by the facility fees that hospitals and their outpatient clinics routinely add on to the bill, the researchers said. “Provider consolidation must be changing the ability of providers in a market to extract higher prices [from insurers] for outpatient cancer therapy,” said Rena Conti, an assistant professor at the University of Chicago and lead author of the study, which was published by the Health Care Cost Institute in February. The study controlled for the volume of patients and the mix of cancers, among other things, she noted. Spending on chemotherapy drugs has been in the news lately as some cancer specialists and patient advocacy groups have strenuously objected to a proposal by Medicare to change how it pays for drugs that are covered under Part B, the program’s outpatient benefit. This study suggests that for patients, it may be more cost-effective to get chemotherapy treatments at a community-based practice rather than a hospital or hospital-affiliated clinic, Conti said. “Patients are increasingly shifting toward high-deductible health plans, and that suggests they’re paying a higher percentage of the costs for these therapies as the prices are going up,” she said. This story was updated to make clear that the study was written by researchers at the University of Chicago. Per patient costs for the total population, actively treated cancer population, and non-cancer population increased at very similar rates over the 11 year study period. In the Medicare population, the increases were 35.2% per patient per year for the total population; 36.4% for the actively treated cancer population; and 34.8% for the non-cancer population. For the commercially insured, the cost increases were 62.9% for the total population; 62.5% for the actively-treated cancer population; and 60.8% for the non-cancer population. The study found large increases in spending for cancer drugs. The portion of these costs associated with all chemotherapy (including biologic, cytotoxic, and other chemotherapy and cancer drugs) in the actively treated cancer population increased over the study period from 15% to 18% in the Medicare population and from 15% to 20% in the commercially insured population. Milliman found that the proportion of chemotherapy infusions delivered in hospital outpatient departments nearly tripled, increasing from 15.8% to 45.9% in the Medicare population during the study period. For the commercially insured population the increase was much more dramatic, going from 5.8% to 45.9%. As of 2014, 340B hospitals accounted for 50.3% of all hospital outpatient chemotherapy infusions in the Medicare population. The study confirmed that patients who had their chemotherapy delivered entirely in the hospital outpatient setting incurred a significantly higher cost than patients whose chemotherapy was delivered entirely in a physician office. For Medicare patients, the difference was $13,167 (37%) higher in 2004 and $16,208 (34%) higher in 2014; for commercially insured patients it was $19,475 (25%) higher in 2004, and $46,272 (42%) higher in 2014.